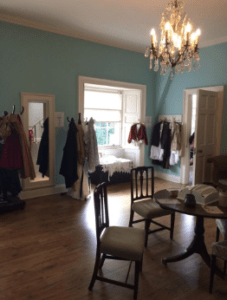 I visited The Georgian House to see what it was like to be a girl living in the Georgian period. The Georgian House is run by the National Trust for Scotland and located is in Charlotte Square, Edinburgh. Charlotte Square was part of the first phase of building for the New Town, making it the perfect place to have The Georgian House. There are five floors, but only four are currently open to the public. The Attic is the top floor but it is currently closed. The National Trust for Scotland are currently fundraising to refurbish the attic and open it to the public. Once open the floor will house the Georgian Day Nursery (which is also the schoolroom), the Night Nursery and the Nursery Maid’s Room. An activity room will also move to this floor. So this means unfortunately a lot of the items related to children and girlhood are not on display at the moment. After you pay your entrance fee, you are guided to start on the second floor. As well as the exhibition and activity rooms, the Second Floor has a film room. The short film is about the history of the house and its first owners, the Lamont family, who moved into the house in 1797. The film is a snapshot in time of the year 1810. The film tells us the Lamonts moved to Edinburgh to send their sons to school and to find marriages for their daughters. It also shows us the life of the upper class girls, who are secluded at home. They learn all they need in the schoolroom or the parlour to run the household and be society ladies. The film shows the Lamont girls to be very fashion-conscious and educated to the standards of the time. They learn skills including dancing, needlework, music and a little arithmetic for doing household budgets. Mrs Lamont is the parent concerned with her teenage daughters’ marriages, and they have dinner parties to invite suitors to meet the girls. At this time married women are allowed to socialise more freely but unmarried girls cannot leave the house without a chaperone. This is shown in the film and spoken of on the information card in the parlour. Next to the film room is the activity room. The activity has costumes so you can dress up like a Georgian man, woman, boy and girl. Young Georgian girls would wear a long high-waisted dress with a petticoat, stockings, mob cap and fichu. A fichu is a square handkerchief tucked into the front of their bodice. The teenage girls would wear muslin high-waisted empire-line gowns during the day, and similar styled gowns made of silk and the like in the evenings. These styles were available to try on over your normal clothes. In the room was also a sampler and some horn books, like the ones Georgian girls would have stitched and all children learnt their alphabet and numbers from. Georgian children were allowed in the nursery and in the parlour only. Each room in the house had a laminated A4 card with information on how the rooms were used, including where the children would be allowed. Another laminated card would also list information all of the artwork on display in the room. All of the main family rooms had paintings on the wall. But where children appeared in the painting they were mainly represented in an allegorical or mythical way. The Parlour is the first restored Georgian room you would enter into. A folder in the room lets visitors flip through contemporary portraits that show what people would wear at the time. This folder included paintings of a girl and a family portrait. All the girls were shown wearing white muslin dresses with a colour silk underslip and a matching sash with lace frills at the neckline and sleeves. The underslip and sash was the only colour in a girls’ outfit. The Parlour was a social space, like the lounge is today. Teenage girls would have sat with their mother in The Parlour as she received visitors for tea. This was an extension of their education. 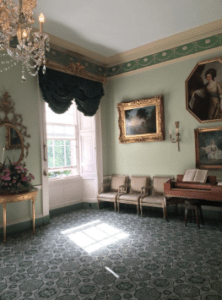 Next to The Parlour was The Drawing Room, where the Lamont daughters would attend dinner parties with their parents to meet potential suitors. The piano and flute in the room would have provided the girls with the opportunity to display their social accomplishments by playing, singing or dancing. Moving downstairs on the ground floor was The Bedchamber, where Mr and Mrs Lamont would have slept. This room had an engraving by Bartolozzi showing a woman reading to young children. All other paintings did not feature children. The Dining Room is also on the ground floor and was the only other room in the house to have children in the paintings. Unlike the other paintings in the house, the children in these ones were actual people and families. Here there was a family group by John E. D. Touche, a Helen Stewart Mrs Colt and her son Adam by David Martin, and The Honourable Helen Colt with her granddaughter Grace by David Martin. These were painted during the reign of King George III. The basement is the last floor in the house to walk through. Down here is the kitchen, store rooms, wine cellar and servant’s quarters. This was the domain of the servants, who were adults and children. The film from the film room spoke of the girls who were in service in the house. There is a teenager named Mary, who started as the scullery maid and by 1810 is the under housemaid. In the kitchen with the cook is a girl named Jessie, who was sold into service by her parents because they could not afford to feed and keep her. These girls would have worked very long days (sometimes up to 16 hours) and go to bed at midnight. The young servants like Jessie would be tasked with having to carry the cast iron kettles filled with hot water around the house, which were very heavy. They would also carry trays upstairs to the family. These trays had an open side would be placed against their chests to ensure nothing fell off. If an accident did occur, the broken items came out of your wages. For Jessie being a scullery maid will be her first job, just as it had been Mary’s. They were the youngest and least paid of the servants. She would assist in meal preparation like preparing vegetables and roasting meat. 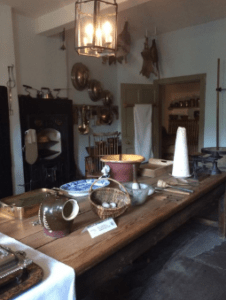 She would clean up after the cook and fetch for her, as well as keeping the kitchen, larder, scullery and utensils all clean for use. She would add coal to fire first thing every morning and heat the water for the household and kitchen use. She would clean up after dinner parties as well. A housemaid like Mary was responsible for the upkeep of the household. This included making and repairing linen for the bed, table and towels; cleaning the furniture and fireplaces; making the beds and fires in each room; opening and closing the shutters in every room; fetching water for the rooms; and emptying the chamber pots. Most of these tasks had to be done before the family woke up. The Georgian servant girl would have had a hard life in the basements of these grand homes. Other positions in the house would have required the hiring of children, but no other positions were recorded during the Lamont’s time as owners in the house. The house shows only half of the story of how Georgian children’s lives revolved around their home and education. Once the Attic restoration is complete, children will be better represented in the house. The girls who lived in the basement would also have had more stories to tell, but the downstairs space has components to share with visitors. Overall the house does display the presence of girls and young women. But this is muted, just like in Georgian times where girls had no publicly active role in society. I strongly advise speaking to the volunteers in each room or reading the information cards. This is the way you will be able to learn about the role and lives of the children in the house. The film is a great introduction to this, and the volunteer staff in each room are very knowledgeable and helpful. Make the most of them should you visit. I think the house in its present state is very good, but will be excellent once funding for The Attic is complete and it can be opened to the public. The house has a good balance of sharing the stories of all members who lived in the house, upstairs and downstairs.